Margaret, the first daughter of Henry VII and Elizabeth of York, was born at the Palace of Westminster on the 28th of November 1489. She was christened two days later in St. Margaret’s, Westminster. One of her godparents was her grandmother, Margaret Beaufort, who was presumably also her namesake. The royal children had their own household at Eltham. In preparation for a future as a royal consort, Margaret was taught to play the lute and clavichord and learned French and some Latin. She was also skilled at archery. From an early age, Margaret was part of Henry VII’s negotiations for important marriages for his children and her betrothal to James IV of Scotland was made official by a treaty in 1502 even though discussions had been underway since 1496. Part of the delay was the wait for a papal dispensation because James’ great-grandmother was Joan Beaufort, sister of John Beaufort, who was the great-grandfather of Margaret Tudor. That made James IV and Margaret Tudor fourth cousins, which was within the prohibited degree. Patrick Hepburn, the Earl of Bothwell, acted as a proxy for James IV of Scotland for his betrothal to Margaret Tudor at Richmond in January 1502 before the couple was married in person. Before Margaret left for Scotland, her family suffered two terrible losses. In April 1502, Margaret’s brother Arthur, eldest of the Tudor children, died in Ludlow Castes on the border of England and Wales. Less than a year later, Margaret’s mother, Elizabeth of York, died shortly after giving birth to a daughter. The child, named Katherine, died shortly after her mother. Margaret finally departed for Scotland from Richmond Palace on the 2nd of July, 1503. On they way she made a stop at her grandmother Margaret Beaufort’s estate at Collyweston, and then continued on the way north. "Thus this fair lady was conveyed with a great company of lords, ladies, knights, esquires and gentlemen until she came to Berwick and from there to a village called Lambton Kirk in Scotland where the king with the flower of Scotland was ready to receive her, to whom the earl of Northumberland according to his commission delivered her." "Then this lady was taken to the town of Edinburgh, and there the day after King James IV in the presence of all his nobility married the said princess, and feasted the English lords, and showed them jousts and other pastimes, very honourably, after the fashion of this rude country. When all things were done and finished according to their commission the earl of Surrey with all the English lords and ladies returned to their country, giving more praise to the manhood than to the good manner and nature of Scotland." 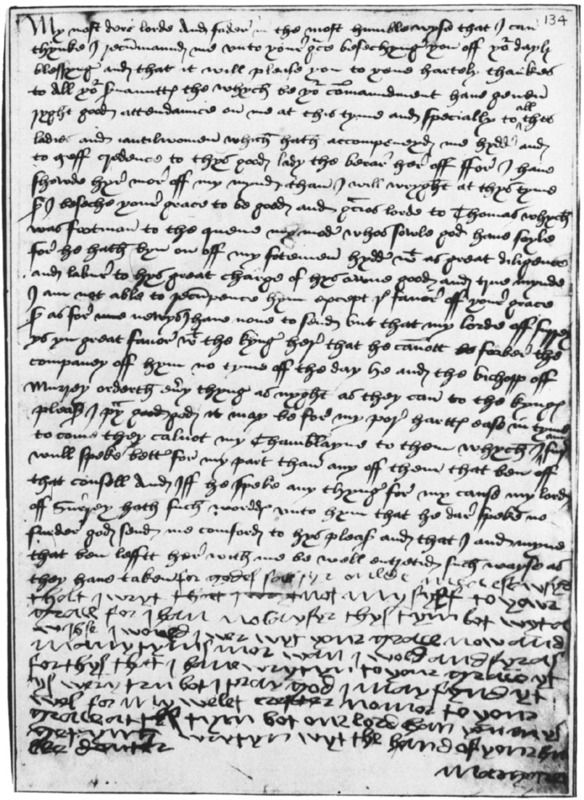 The wedding finally took place for real (after several proxy marriages) on 8 August, 1503 at Holyrood House in Edinburgh – Margaret was 13 and James was 30. Margaret was officially crowned Queen in March 1504. The Scottish poet William Dunbar (1460–1513) wrote several poems to Margaret around this time, including “The Thistle and the Rose”, “To Princess Margaret on her Arrival at Holyrood” and others after she was Queen (see the poetry page). Margaret’s first pregnancy was in 1506 and she gave birth to a son, James, in February 1507 who lived about a year. Margaret next gave birth to a daughter in July 1508 who only survived for a few hours. In 1509, Margaret’s father died and her brother was now Henry VIII, the new king of England. Early in that year Margaret became pregnant once again and gave birth to another son, this one named Arthur, in October. However, this child also died at a young age, only nine months old. Margaret’s next child was born on April 11, 1512 at Linlithgow and named James. This child, unlike all those before him, lived to adulthood and at little over a year old he was to succeed his father as James V. The Queen became pregnant yet again shortly afterwards and gave birth to another daughter, who died a few hours later. In the first few years of Henry VIII’s reign, the relations with Scotland became strained, and would eventually erupt into war. In 1513, Henry VIII went to France to conduct military campaigns and made Queen Catherine of Aragon regent the the Earl of Surrey (who had conducted Margaret to Scotland for her wedding) was in charge of the forces that had remained in England. Surrey and the Queen took forces to the northern border, waiting for the Scottish attack. 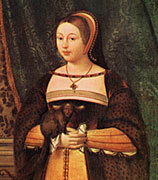 Margaret was pregnant for what would be the last time by James IV. James began his march to the border in August and actually crossed the border into England. The final battle in this conflict would be on September 9th at Flodden Field where James IV died in battle leaving his and Margaret's infant son as King James V. The boy was crowned King on September 21st and according to James IV’s will, Margaret was to act as regent until James came of age as long as she did not remarry. At the time of James IV’s death, Margaret was pregnant with the the late King’s child. The baby, a boy named Alexander, was born in April 1514 and given the title Duke of Ross. Margaret did not help her case for remaining regent by remarrying in August 1514. Her second husband was the powerful Scottish lord Archibald Douglas, 6th Earl of Angus. John Stuart, Duke of Albany (a cousin to the king, and next in line to the throne after little Alexander’s death), was invited by the Scottish lords to be Regent. Albany had been living in France with his mother’s relatives and served three French kings - Charles VIII, Louis XII and Francis I. Albany arrived in Scotland in May 1515. Despite being pregnant, Margaret and her husband fled to England in September 1515 after her children by James IV (James V and Alexander) had been taken from her, she was denied the regency and she was not receiving her income from James' will or the revenues from her lands in Scotland. Her brother arranged for her to be lodged comfortably at Harbottle Castle in the north of England and it was there that she gave birth to her daughter, Margaret Douglas in October. Margaret fell very ill after her daughter's birth and nearly died. Her younger son by James IV, Alexander Duke of Ross, died in December of that year, but Margaret was not immediately informed due to her bad health. Margaret's husband returned to Scotland, but she journeyed south to London, arriving in May 1516 where she was welcomed with festivities that lasted for a month. Margaret stayed in England for about a year before returning to Scotland under promise of safe conduct in June 1517. The marriage of Margaret and Angus turned out to be disastrous. While he was in Scotland and she was in England, Angus had taken a mistress and was living off of Margaret's Scottish revenues. The next few years were terrible for Margaret, with a horrible marriage, no money, no power and very little contact with her son James. In 1524 Margaret, in alliance with the Earl of Arran, overthrew Albany's regency and her son was invested with his full royal authority. James V was still only 12, so Margaret was finally able to guide her son's government, but only for a short time since her husband, Angus, returned from England and took control of the King and the government from 1525 to 1528. In March 1527, Margaret was finally able to attain an annulment of her marriage to Angus from Pope Clement VII and by the next April she had married Henry Stewart, who had previously been her treasurer. Margaret's second husband then arrested her third husband on the grounds that he had married the Queen without approval. The situation was improved when James V was able to proclaim his majority as king (he was 16 at the time) and remove Angus and his family from power. James created his new stepfather Lord Methven and the Scottish parliament proclaimed Angus and his followers traitors. However, Angus had escaped to England and remained there until after James V's death. Margaret's relationship with her son was relatively good, although she pushed for closer relations with England, where James preferred an alliance with France. In this, James won out and was married to Princess Madeleine, daughter of the King of France, in January 1537. The marriage did not last long because Madeleine died in July and was buried at Holyrood Abbey. After his first wife's death, James sought another bride from France, this time taking Marie de Guise (eldest child of the Claude, Duc de Guise) as a bride. By this same time, Margaret's own marriage had followed a path similar to her second one when Methven took a mistress and lived off his wife's money. On October 18, 1541, Margaret Tudor died in Methven Castle in Scotland, probably from a stroke. Margaret was buried at the Carthusian Abbey of St. John’s in Perth, Scotland. Although Margaret's heirs were left out of the succession by Henry VIII and Edward VI, ultimately it would be Margaret's great-grandson James VI who would become king after the death of Elizabeth I.